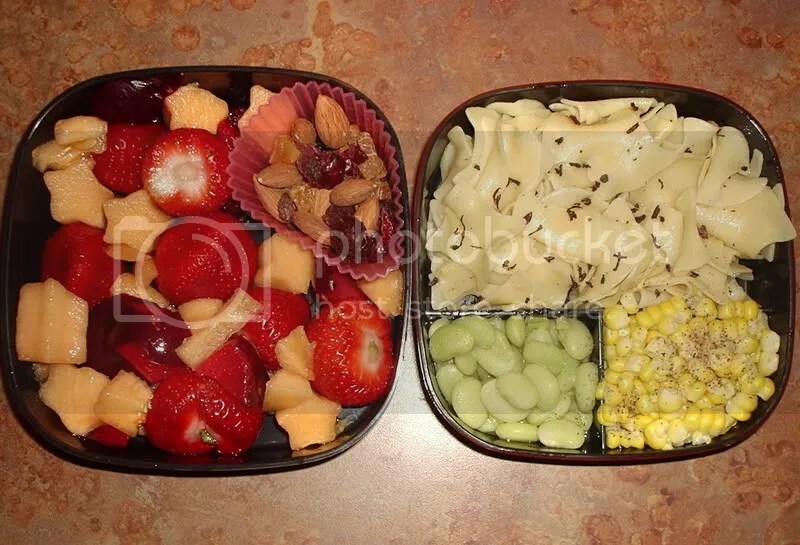 Here’s the bento I made last night for my lunch today. I used some leftovers from dinner and then made a fruit salad to accompany it. 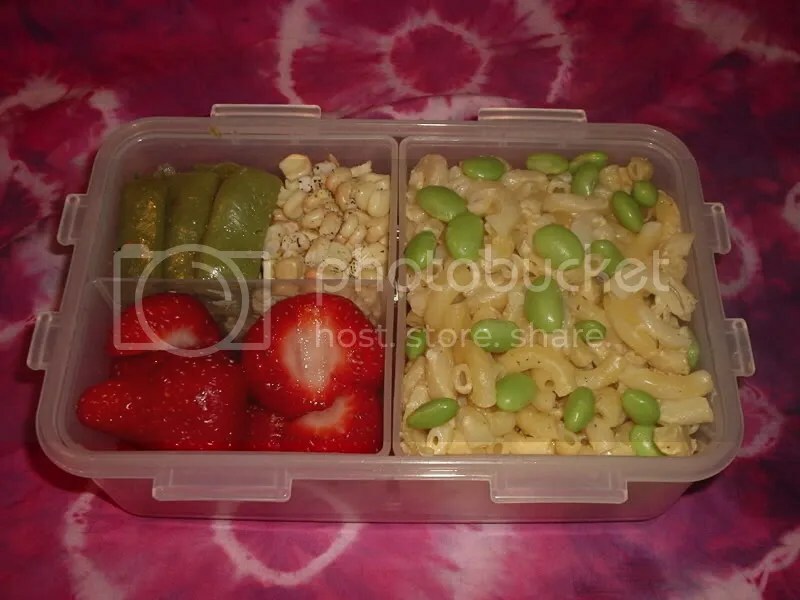 I added some furikake that I found that is vegan on the noodles and put some baby lima beans and cut some corn off the cob from dinner. For the fruit salad, I used some fresh strawberries and cantaloupe and put some dried fruit and raw almonds in a baking cup. Raw almonds are so good, when I went to the store the other day I had to get some to go with the dried fruit. It looks really good and I can’t wait for lunch to come to eat it! I know I’ve been kind of lazy about the bentos lately, but I’m going to get back on track soon! 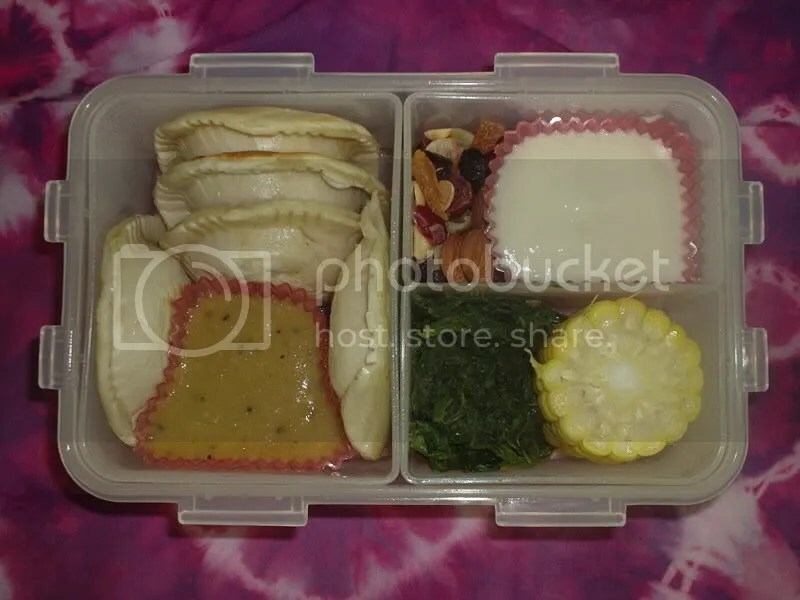 Here’s the bento I made for work today. 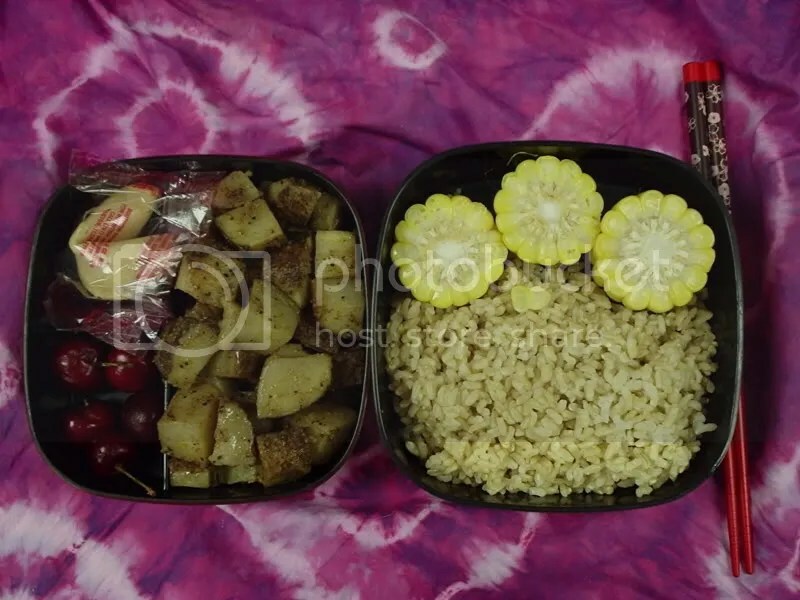 On the right there’s brown rice and corn on the cob, on the left there’s a fortune cookie, cherries, and some spiced potatoes. 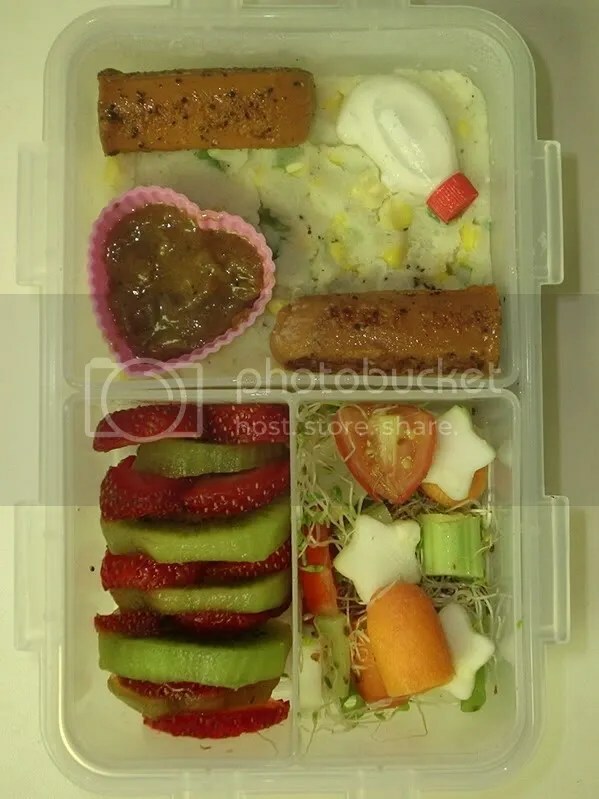 Today’s bento is more “homestyle” than the one from yesterday. I made it this morning w/ leftovers from last night’s dinner a couple other little extras. I went ahead and added another little container with salad for today because I got hungry yesterday afternoon after I had eaten my bento. 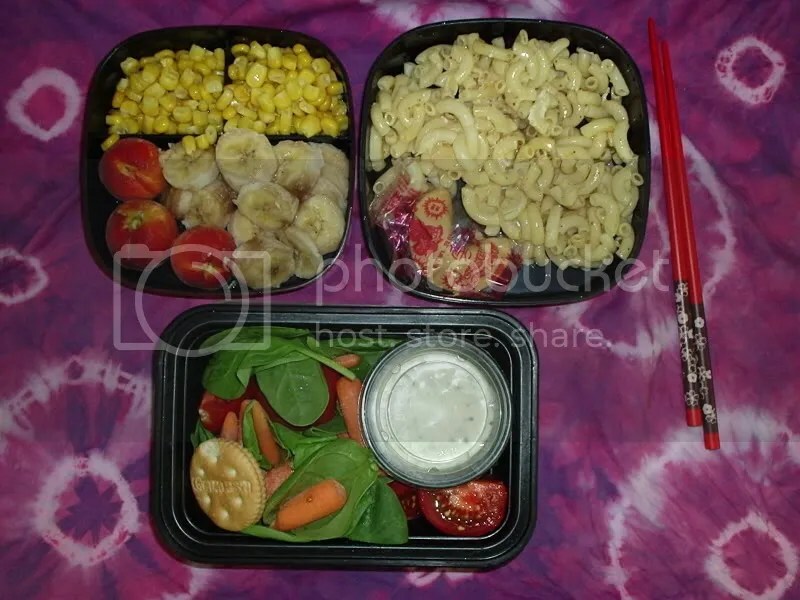 There’s corn, peaches, banana on the left; vegan mac and cheese and a fortune cookie on the right. And of course salad on the bottom. It has spinach, tomato, baby carrots, vegan ranch dressing and a couple crackers.